I want to send a reminder to all of you for this exceptional workshop from this exceptional artist. If you are not familiar with Hsin-Yao's art, I highly recommend you check his work online. Hsin-Yao is one of few I consider a genius. He has reached his success in the art world at very young age. Look at this extraordinarily beautiful portrait he did. I have been inspired, and learned a lot from him when I was studying at Art Academy of Art University in San Francisco. 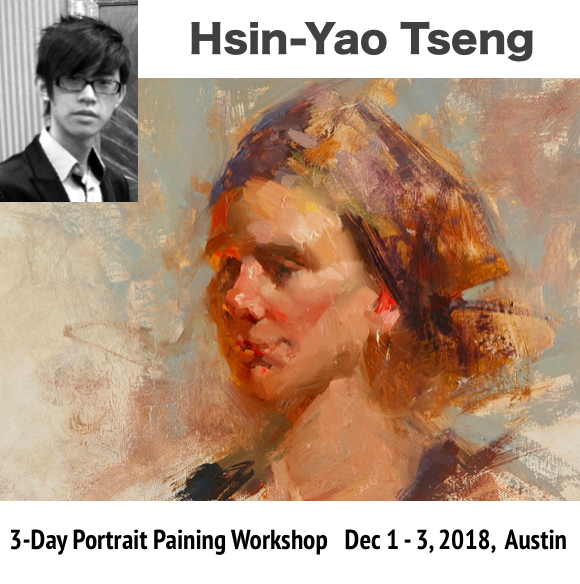 It has been a rare opportunity I invited Hsin-Yao come to Austin to teach. I hope you all also can take advantage of this special learning opportunity to bring your portrait work to the Master level. Please check Hsin-Yao Tseng workshop and sign up soon.